Former Prime Minister Baroness Thatcher has died "peacefully" at the age of 87 after suffering a stroke, her family has announced. David Cameron called her a "great Briton" and the Queen spoke of her sadness at the death. 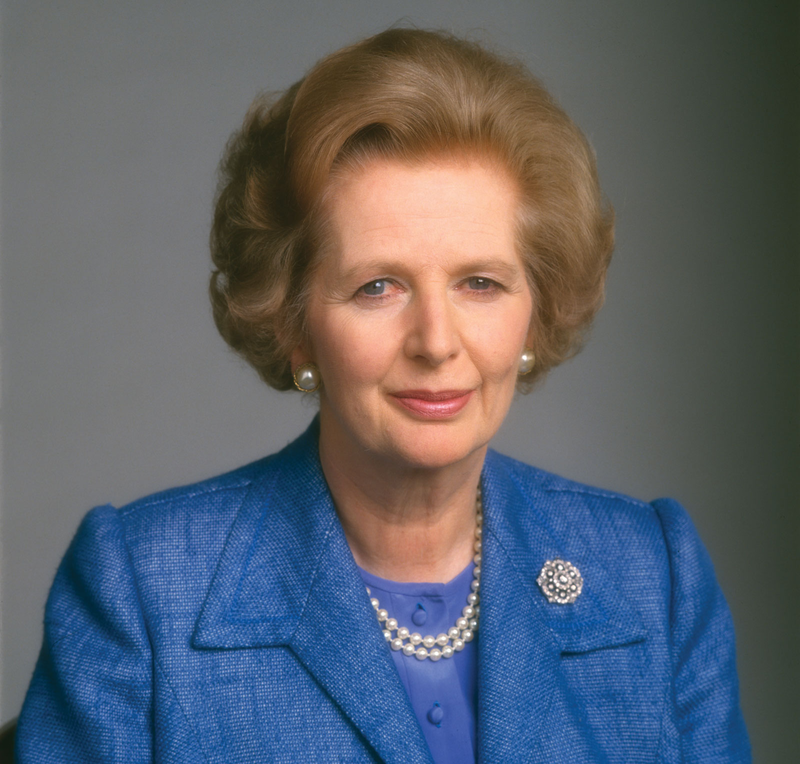 Lady Thatcher was Conservative prime minister from 1979 to 1990. She was the first woman to hold the role. She will not have a state funeral but will be accorded the same status as Princess Diana and the Queen Mother. The ceremony, with full military honours, will take place at London's St Paul's Cathedral. The union jack above Number 10 Downing Street has been lowered to half-mast. Mr Cameron, who is in Madrid for meetings, has cancelled planned talks in Paris with French President Francois Hollande and will return to the UK later on Monday. BBC political editor Nick Robinson said Lady Thatcher had been a controversial politician who inspired "passion" among both her critics and supporters. Her government privatised several state-owned industries and was involved in a year-long stand-off with unions during the Miners' Strike of 1984-5. She was also in power when the UK fought a war following Argentina's invasion of the Falkland Islands in 1982. Lady Thatcher survived an assassination attempt in 1984, when the IRA bombed the Brighton Grand Hotel, where she was staying for the Conservative Party's annual conference. During her later years in office she became increasingly associated with Euroscepticism. She is also seen as one of the key movers behind the fall of communism in eastern Europe. She stood down in 1990 after she failed to beat Michael Heseltine by enough votes to prevent his leadership challenge going into a second round. 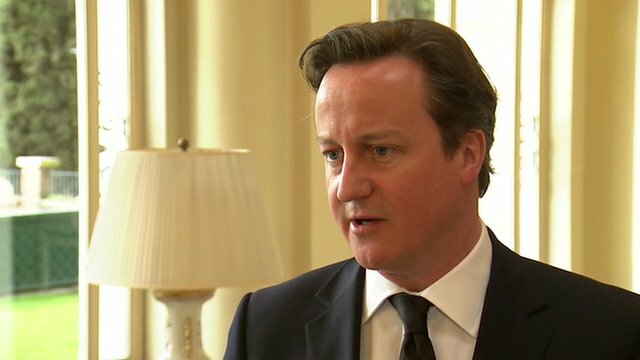 Mr Cameron told the BBC: "Margaret Thatcher succeeded against all the odds. The real thing is she didn't just lead our country; she saved our country. "I believe she will go down as the greatest British peacetime prime minister." A Buckingham Palace spokesman said: "The Queen was sad to hear the news of the death of Baroness Thatcher. Her Majesty will be sending a private message of sympathy to the family." Lady Thatcher, born Margaret Roberts, served as MP for Finchley, north London, from 1959 to 1992. Having been education secretary, she successfully challenged former prime minister Edward Heath for her party's leadership in 1975 and won general elections in 1979, 1983 and 1987. Sir John Major, who replaced Lady Thatcher was prime minister in 1990, called her a "true force of nature". He added: "Her outstanding characteristics will always be remembered by those who worked closely with her: courage and determination in politics, and humanity and generosity of spirit in private." Former Labour Prime Minister Tony Blair called her a "towering figure", while his successor Gordon Brown praised her "determination and resilience". Labour leader Ed Miliband said Lady Thatcher had been a "unique figure" who "reshaped the politics of a whole generation". He added: "The Labour Party disagreed with much of what she did and she will always remain a controversial figure. But we can disagree and also greatly respect her political achievements and her personal strength." Deputy Prime Minister Nick Clegg described Lady Thatcher as one of the "defining figures in modern British politics", adding: "She may have divided opinion during her time in politics but everyone will be united today in acknowledging the strength of her personality and the radicalism of her politics." London Mayor Boris Johnson tweeted: "Very sad to hear of death of Baroness Thatcher. Her memory will live long after the world has forgotten the grey suits of today's politics." UK Independence Party leader Nigel Farage called Lady Thatcher a "great inspiration", adding: "Whether you loved her or hated her nobody could deny that she was a great patriot, who believed passionately in this country and her people. A towering figure in recent British and political history has passed from the stage. Our thoughts and prayers are with her family." SO, what was your opinion of her? She was much loved by some, much hated by others. I think she was a great lady. She and President Reagan defeated communism and were heroes here in the United States. Thanks for these news articles about her. I liked the comment that she will be remembered long after the gray suits of today's political scene. She was a true fighter for right. Amrita! You have been off-line for a long while! Everything OK over there?